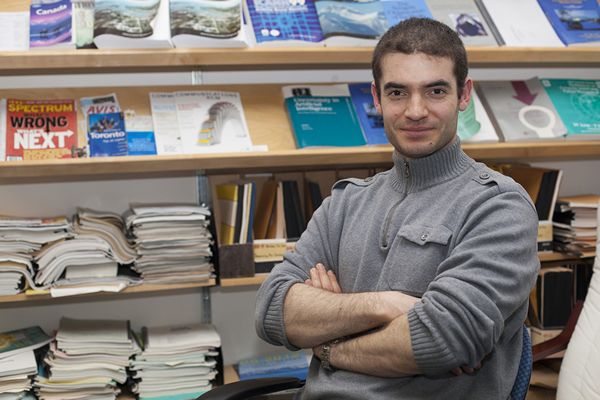 Computer science and mathematics graduate Ilya Sutskever (MSc 2007, PhD 2013) no longer remembers the name of the California restaurant where the idea of a non-profit artificial intelligence research company first emerged. But a dinner conversation between Sutskever, billionaire tech entrepreneur Elon Musk, Sam Altman, president of Y Combinator, the largest U.S. seed fund, and Greg Brockman, the former chief technology officer of Stripe, among others, put forward a plan for OpenAI. Just five years ago, Sutskever, fellow PhD student Alex Krizhevsky and world-renowned computer science professor Geoffrey Hinton had developed an image recognition algorithm that dramatically outperformed all existing algorithms, by training a very large neural network on a dataset of 1 million images. The trio founded DNNresearch Inc., named after the deep neural networks – or deep learning – used by their system and within a few months, their startup was sold to Google Inc. Both Krizhevsky and Sutskever joined Google as research scientists. Hinton also joined the company and is now a vice-president engineering fellow at Google. Today Sutskever is the research director for OpenAI. He talked with U of T's Nina Haikara about his time at the university and Google with Hinton and Krizhevsky, today's artificial intelligence renaissance – and that first dinner conversation at a restaurant located somewhere along Sand Hill Road in Menlo Park where many venture capital firms reside.